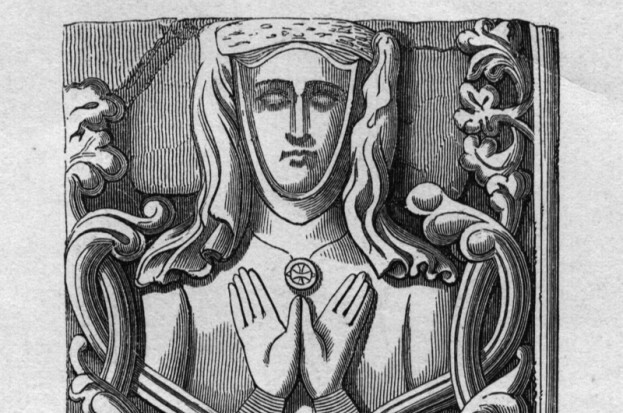 I frequently receive comments on my posts and blogs that Joan of Kent must indeed have been an outstandingly beautiful woman. Do not the images of her, that can be found widely on the internet, prove it? The answer has to be no, for the most part they do not. There are indeed a number of images of Joan of Kent but very few are contemporary. They are certainly not authentic and give no true idea of her attractiveness or otherwise. Even worse, many of these picture of Joan give no indication of their origins, so that any net-surfer might well believe that they are accurate. Instead, they are figments of the artist’s romantic imaginings. Some of them I admit to finding ‘cringe-worthy’. I dislike then intensely and find them historically misleading. Take this one for example. 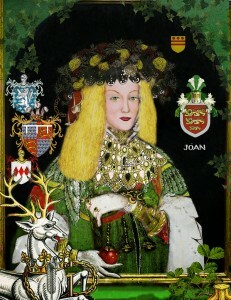 A 20th century rendition of what Joan may have looked like. It is certainly not a 14th century image. It comes purely from the artist’s colourful imagination. Beauty is definitely in the eye of the beholder. And then there is this one. Despite the ‘historic’ background and ‘pseudo-medieval’ trappings and dress and coat of arms, it has no veracity whatsoever, and is part of a 20th century collection of similar impressive but inaccurate images of important women. I find them sentimentally affected. It is all guess work, made to look historic. 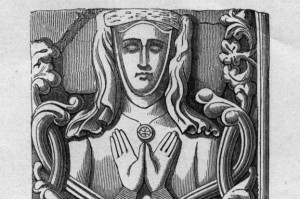 This is an engraving on a wooden board, it is said from around 1385, the year before her death, and titled as an authentic image of Joan. I can find no real authority to say that it is Joan, merely labels stating that it is, without any evidence of where it originated. I can find nothing of its origin or where the engraving – which is quite likely to be 14th century – is to be found now. 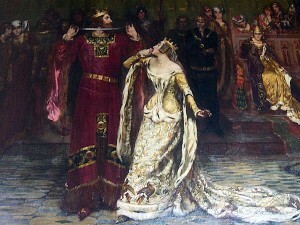 Here is a painting of Joan and Edward III from the early 20th century. Joan’s name was much associated with scandal, apart from her clandestine marriages. She was said to be the lady whose garter Edward rescued, which was to become the insignia of the Order of the Garter. There is no evidence of truth here. Joan’s name was not associated with these scandalous events until the 1500s, nor is this painting anything but a dramatic work of art, with Queen Philippa glowering in the background. In soite of its limitations, I quite like it. 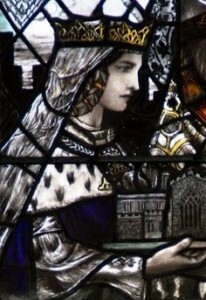 This, below, is an image of Joan of which I am very fond, in a stained glass window, made in the early twentieth century by the celebrated artist Christopher Whall, which shows Joan holding the model of the church at Ware in Hertfordshire, which she paid to have restored. It is cool and elegant, but much as I like it, I cannot guarantee that this is anything like how Joan actually looked. But we must remember that Froissart was appointed as her secretary by Philippa of Hainault who was responsible for Joan’s early upbringing at the English court, while Chandos Herald was a close friend of Prince Edward, so neither of them would perhaps be prepared to be too critical of Joan’s appearance. Still it’s good to know that some who knew her thought that she was beautiful. But still we have no real description of Joan, of her figure, her face, or even the colour of her hair. This is what we have. It can be disappointing. This is contemporary image of the lady. A lovely image of Joan with a mirror, as depicted in a manuscript from the Abbey of St Albans. But it is very small and stylised and not intended to give a true representation of her features. 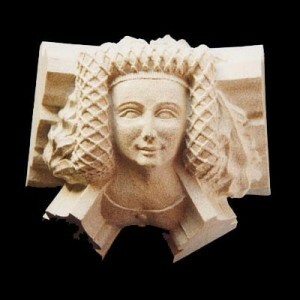 There are two roof bosses in Canterbury Cathedral that at are thought to be representations of Joan. This one is to be found in the Black Prince’s Chantry, with Joan, her hair confined, as was fashionable, in a magnificent golden net. It is less than flattering of her in later life. It is said that in these final years Joan was ill and increasingly obese so that she could travel rarely. And this one, far more flattering, in the north nave aisle of Canterbury Cathedral, possibly of Joan. So where does that leave us? By the time we reach the Tudor period we are blessed with useful portraits of all the royals so that the characters are immediately recognisable. For medieval women we are left to our own imaginations. But all in all, I do think that Joan the Fair Maid of Kent was a beautiful woman. Even her enemies had to admit it. I’ve only recently started reading your books, Anne – I have to say I am enthralled, I am thoroughly looking forward to reading about Joan, Fair Maid of Kent. I was recommended to your books earlier this year after reading similar books by other well known authors. I am plodding through, collecting and reading your back catalogue. It’s clear I am going to need another bookshelf before long! Anne I’ve never read any of your books and would be thrilled to win a copy. I’m currently in the middle of writing a trilogy on Anne Boleyn as well as a non fiction work on the disabled of both the Tudor and Victorian eras. Hi Anne I love to read anything historical sad to say it’s mostly about the Tudors. However I have read a couple of your books and have found this blog interesting… Is it possible that Joan of kent was found to be fair in those times? I have been a huge fan of Anne O’Brien for many years now and have all her books and I cannot wait for this latest one on Joan of Kent! I agree that we will never know for sure exactly what Joan looked like but it is safe to say that she was indeed a beauty, something that has been noted in the centuries since she lived. I would love a copy of your book. I imagine provenance for any historical image is difficult to verify and beauty ideals changed with the centuries eg Rubenesque women by today’s standards deemed obese! I digress the point I was trying to make was tho she was known as Joan the Fair we have no way to judge but I like to think it was her personality rather than her looks! 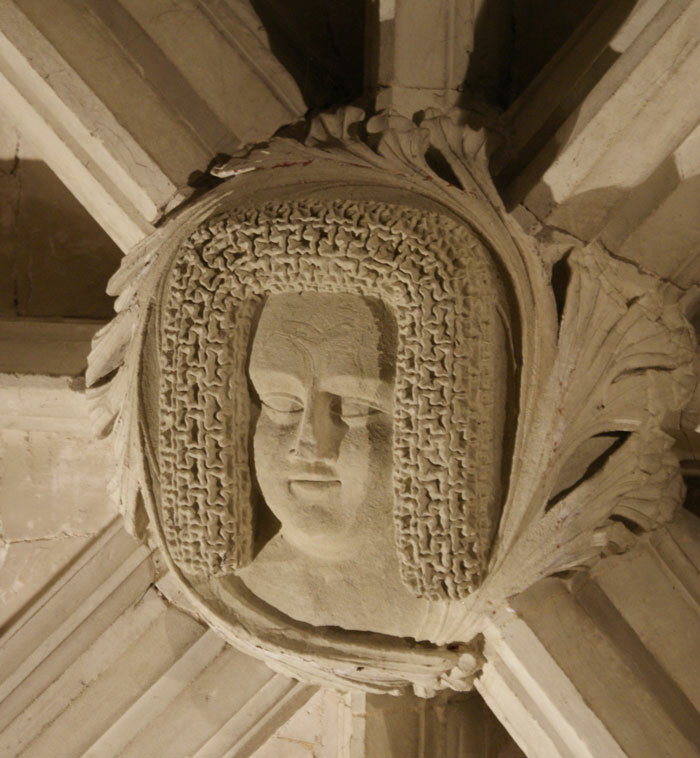 The last image, from the north nave of Canterbury Cathedral, is my favourite – she looks lively and fun, and one can easily imagine her embroiled in scandal! Of course, our standards of beauty are not medieval ones. I’ve read the shadow queen twice now and have to say its by far my new favourite book! My thoughts on her beauty is that yes she was a beautiful woman (even if we wont know exactly what she looked like) but her demeanor was also an aspect of her beauty. I have read all of your books and love them all ! I like to imagine that she was beautiful and capture the hearts of men not only for her beauty but by her romantic nature and her educated mind. It’s a pity that we don’t much of how she looked like but perhaps it doesn’t matter in the end. She was more than a pretty face as she was an extraordinary woman who is still talked about nearly 700 years after her death ! Very interesting. I am writing my dissertation on her so have both sources quoted. I would however love to read your novel and your views on a controversial life. An extremely interesting and enlightening article. I love reading Historical Fiction, anything Medieval. I’ve recently been introduced to your books, I have read two and enjoyed them so much. I have read a couple of books on Joan of Kent and I do believe she was very beautiful. It is hard to tell by the photos, but I think she is beautiful in all of them. I think she was perhaps quite pretty but her mannerisms and demeanour would have probably been taken into account too. She was probably quite graceful, discreet, polite etc that added to her charm. I would love to have your book. I think since Black Prince married so late in life, maybe people didn’t understand his choice. Would love to read this book. I find myself only reading novels of the medieval and Tudor periods. So fascinating!!! I would love to win of your book. I had read all you have written expect Joan of Kent. I suppose by today’s standard it would hard to say how beautiful she truly was but I am sure the paintings don’t do her justice. As we have heard many times, “Beauty is in the eye of the beholder.” I think we might add ‘or in the brush of the artist or ‘in the knife of the engraver.’ I enjoyed your post. Interesting article, beautiful or not I think she was an interesting woman and would enjoy reading your book. Thank you for the chance!! Very interesting. The middle ages enthrall me and I have recently become interested in Joan. Looking forward to reading your new book. I love your books and others from that period of time. I would Love to win this book. I still enjoy holding, reading even the smell of a book. I have admit that yes I do also read e books : ). Pick me please ! I have all of Anne’s books and adore them! In fact I ended up looking into Kathryn swydnford in more depth after the scandalous duchess! Can’t wait to read this one about Joan! It must be incredibly frustrating for you as an author to not know what Joan looked like. I like to think the north nave aisle of Canterbury Cathedral’s version is her, as that’s the one most fitting the image in my head. I’m looking forward to your new book, Anne and finding out more about this fascinating woman. 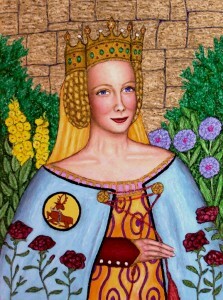 Hi Anne, I would love to read about Joan of Kent , especially in a book that you have written. The last image of Joan, in Canterbury is the most attractive and thank you for sharing this information. She must have been beautiful by the standards of the day, as she was often reported as “fair”by many contemporary sources. She must have been a strong willed character and full of charm to enable her to attract The Black Prince. Love your books, and if I won this signed copy I would give it to my daughter who is following in my footsteps with a fascination for medieval history. Joan, Fair Maid of Kent, certainly was a beautiful woman. She would not have left such an impression on so many people of that time. I have always closed my eyes after reading stories about historical characters and tried to imagine how they might have looked. All we know of this time period is the type and colours of clothing, head dresses and hair styles and artists do their best in recreating her likeness by the impressions of those who knew her. I have enjoyed so many of your books over the years and hope to read many more of them. You do make your characters come alive in telling their stories. As many people have noted, what we consider to be beautiful today is very different to that which was considered beautiful at different points in history. I relish reading your novels and am delighted each time I view medieval life from the female perspective – so often forgotten in much historical writing. Your fiction, based on historical facts, has inspired me towards wider reading about the medieval period. Thank you for bringing history alive. I haven’t yet read ‘The Shadow Queen’ so a copy of your book would be enthusiastically received! My husband and I have lately had conversations in the same vein. Perceived beauty is entirely subjective and all we have to go on for our medieval heroines are the few potentially biased words of the better known chroniclers. In later times we have more contemporary accounts and some illustrations of the more well off members of society. By the Victorian and Edwardian periods we have accurate photographic evidence as well where we see modesty and the natural look is desirable for the most part and then a sudden shift in the Art Deco period to exposed limbs and carefully applied cosmetics which we are told is what makes a woman beautiful. Quick trip to 2017 and we see women with multi coloured hair, numerous piercings, heavy cosmetic use and features which have been enhanced by plastic surgery. What will future historians deduce about our definition of beauty from that? I believe that Joan was a great beauty of her time. But it was not just her about her features, it was also about how she carried herself in the face of scandal. Her grace and beauty obviously won the heart of Edward the black prince. I would love to read your take on her very interesting story! Beauty is in the eye of the beholder as I believe the quote goes. I’m sure in Edward’s eyes she was beautiful not only on the outside but on the inside. Reading about her, Joan comes across as a rather ‘savvy’ woman who knew her own mind, yet her position and role playing it well. Absolutely adore your books and this period of turbulent history. I think that we have to think what was considered beautiful in Joan’s time? Also beautiful is a word that can be used to describe inner and outer beauty. There is a lot to be said for one’s personality affecting one’s appearance. My nephew bought me three of your books for my Birthday. I have really enjoyed them. I love this period of history and look forward to reading many more of your books. I have read and enjoyed many of your books and thank you most sincerely for encouraging my love of medieval history. To be chosen to win the book the Shadow Queen would be such an honour and I would love to be in receipt of your kindness. As previously stated, Beauty is in the eye of the beholder. In this case must have been many beholder ‘s! Really enjoy your almost daily comments on Facebook. (as have been living in Australia for many many years and probably will not have opportunity to visit the places you show and discuss) It is hard to select a favourite in the books of your ‘s that I have read. Always sad to finish. I am so excited to start reading this book. You bring history to life with your novels. I am a huge fan of historical fiction generally and love to immerse myself into the lives of these wonderful people. I have really enjoyed reading your other books, and would love to win a copy of this. I enjoy reading books based in other era’s of history. Love your books,so enjoy going on a journey back in time with your amazing writing,stepping back into history such an adventure !! Thanks for being a writer and thanks for a chance to win !! Thank you Anne for such an interesting article on the frustration of not knowing what those who lived so long ago looked like. I would love to win a copy of your book please. Beauty truly is in the eye if the beholder, the historian, or sometimes, the artist, and unless we speak of contemporaries, we really fon’t know in so many instances. I truly love your prnchant for accuracy as well ad your beautiful way of bringing history roaring back to life. I’d love to win a copy of The Shadow Queen to go with my copy of Forbidden Queen— but I’m being greedy. Such an interesting article ! I believe Joan was a great beauty of her time and the last image is the one I like most. I’d like to imagine her like that. I have all your books but I still haven’t read this one as I alwsyslike to have one of your books to look forward to. Please keep on writing and giving us more books. Thanks for all the information you share with us. Anne O’Brien never ceases to amaze, another novel just when you think everything possible has already been written she comes up with another amazing novel. I so look forward to each one. I love looking at royal portraits and it is frustrating not to know what a significant historical figure really looked like. I would love to see a proper likeness of Elizabeth Wydville and Edward IV. The latter’s usual portrait doesn’t exactly show the handsome, charismatic god, does it? Wouldn’t it be wonderful if royal permission were given to open their tombs, take photos of their skulls and use computer imagery to produce a definitive picture? Even when the Tudors caught on to the PR value of portraits, there is some argument about, say, what Anne Boleyn really looked like. The portrait with which we are all familiar is nothing like the one in the ring her daughter wore. And, there have been some appalling portraits of QEII. In days gone by, if the subject didn’t like the finished result, I wonder what happened to the painter. Churchill burned the Sutherland portrait, but can you imagine what Henry VIII would have done if he didn’t like his depiction? Joan of Kent is always tagged with the ‘Fair Maid’ addition, so one wonders what women whose beauty became their principal weapon truly looked like. Eleanor of Aquitaine is another intriguing one. As a armchair British monarchy enthusiast, I thought I had discovered every author of quality historical fiction. Then one day at a used book shop, I discovered four of your novels! I was so excited I immediately went on Amazon to order two more before even starting the first. I just finished “The King’s Concubine”, which had me enthralled me from the beginning. I loved your multi-faceted depiction of Alice Perrers. She was neither a saint, nor sinner. She was a survivor. I am a few pages into “The King’s Sister,” which is going to be as divine as the first novel of yours I’ve read. I can feel it! Thank you for writing about these incredible women! 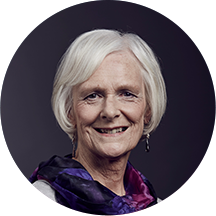 Thank you Prof. Anne I have just found your site , taken a while as I am 87 yrs and have a fascination for all Medieval History, just wish I had time in my youth to have had the time to read all of it. Joan must have been an extremely attractive woman to make her younger cousin, the heir apparent of the English throne, to marry her. By that time she had married twice and had given birth of five children and this marriage was a missed opportunity for the kingdom from political perspective. Her son Richard is also well known as one of the most handsome monarchs of England , so it is likely he inherited his beauty from Joan. After reading history for thirty-five years, I’ve started exploring historical fiction; a friend recommended ‘The Shadow Queen’, and I really enjoyed it. Impeccable history, and the ‘made up bits’ are beautifully done. I will read this author’s whole catalogue.